MAD MEAT GENIUS: "JUST BEET IT, BEET IT!" 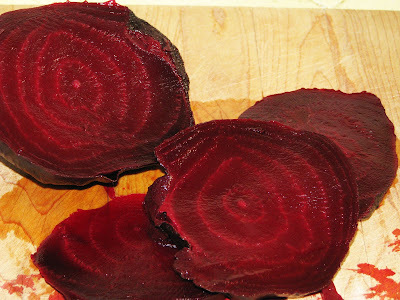 What did Michael Jackson have against Beets? 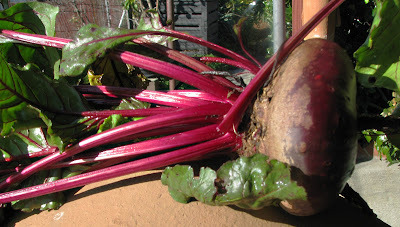 It just so happen some beets are still in the Mad Meat Genius garden. They were harvested and baked in an oven. These are sweet treats. Serve them with a little olive oil, splash of vinegar and salt and you have a home grown treat. 'Just Beet It'! Do you know, I love beets, and Zio won't eat them. Any grilling thoughts? Grilling usually wins the day. Zio and Zia, look out! I am inspired. Just Beet It! Homegrown beets. I haven't planted that crop yet, but your photo is so intense, I think I will. Zia: Just a thought -- could you wrap unpeeled beets in foil and bury them in the embers? cookiecrumb, You should hire the Reverend/Doctor. He can cook anything in the fire pit of your mind and Marin lawn!!!! Cookiecrumb, I meant to say the beautiful fire swirling peace loving beautiful person that you are. Beet lover over here! I like Cookie's and Zia's ideas. It's a cryin shame that besides Dwight Schrute, not many folks appreciate the true beauty of Beets!